Get the simplified IP3 accreditation guide here. A member with an IP3 accredited scheme of certifying their individual members will be able to apply the IP3 global standard to their certified members. The quality and consistency of standards will be heavily dependent on the processes by which those bodies are accredited. The organization has the maturity and viability required to sustain an effective professional organization and to maintain the required standards over the longer term. Provide additional resource and assistance for member societies in developing countries. The IP3 aim is not to build a fully formed international profession, but to build a framework that will facilitate the development of such a profession through action by member societies. Level 1: A set of definitions to ensure a consistent base of common understanding. Only those items that are essential to providing a solid foundation for an international profession are included at this level. Level 2: Intended to cover the other essential and some advisable ingredients for an effective profession in terms of both standards and governance processes – within this it is the intention to allow national bodies maximum freedom to develop in a way that best fits their local needs. Level 3: Includes the standards and processes necessary to ensure a consistent international standard for both national institutions and for individual practitioners. There is no accreditation fee, however, the accreditation effort will have some direct and indirect costs. Resources need to be allocated to manage the accreditation application process and the logistics associated with the visit. 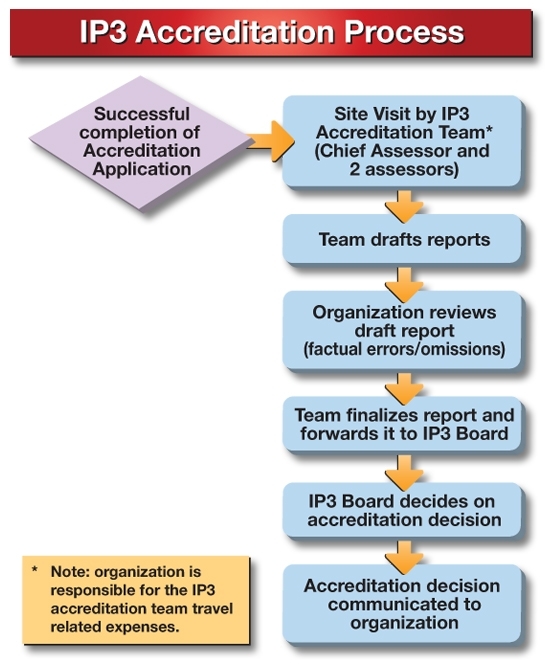 A three (3) person IP3 accreditation team will conduct a site visit, which typically takes around 3-4 days. The team will be assisted by an independent panel member from the organization’s country. The organization will be responsible for any costs associated with the site visit, including travel, accommodation and food and beverage. IP3 encourages organizations to use the IP3 suggested Visit Agenda. The agenda outlines who the team needs to meet with and ensures that a proper assessment and audit can be carried for all relevant areas.